iHeartPrettyPolish: Claire's Candy Shop - ABC Challenge "C"
Claire's Candy Shop - ABC Challenge "C"
Here is my "C" polish for the Alphabet Challenge (if you would like to join, add your link to the links below). 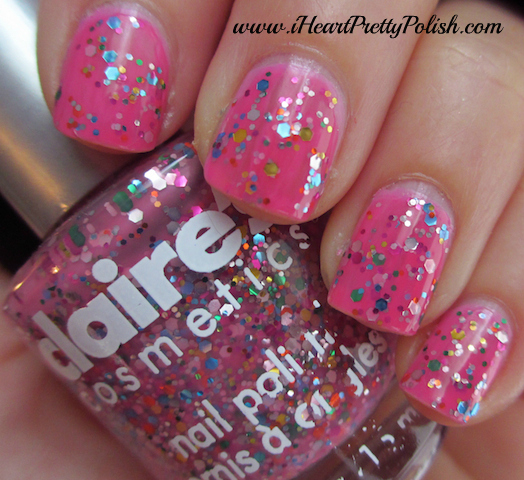 I have never bought/tried a Claire's polish before, but I had to get it when I found out that it was a dupe to Deborah Lippmann's Candy Shop. I had that on my wishlist for quite some time and then this emerged. I already have a swatch of this, but I posted it when my blog was new and I only took pics of my thumb (click here to see LOL). It's fun looking back at old posts! I layered this over Zoya Shelby to have a more opaque base. I love the look of this and am going to enjoy looking at my nails today while at work. I'm not, however, going to enjoy taking this off...argh, glitter:( I will be doing the foil method for sure! This looks really good with the layered base. When I tried it, it looked kind of dull! I'm definitely taking note for future uses! I really like it over the base! Looks great on you. This was one of the first swatches on my blog too- my photos sucked lol! You make me want to re-swatch and do a better job of it! Very cute! I have the DL version and I love it! so everytime I hear this name, "Candy Shop" this song comes to mind: "I'll take you to the candy shop" by 50 Cent... naughty naughty!! haha =))) awesome glitter!!! LOL, I never thought of that. I haven't heard that song in years! So pretty on you! I'll have to try mine out! Thanks for sharing! These look great together! Boy do I ever feel the same about glitter... Removal is the frikken pits! That's why I usually just do an accent nail, then it's not as time consuming.